•For RivEX to function correctly your network must be topologically correct. It is possible to run an incorrect network through RivEX and generate false positive results. This is possible because the incorrect network is still a valid network but it may break in places. For example if a tributary of the Amazon was not connected at the node of the tributary junction then many 1000’s of Km of river would be ignored by the algorithm! It is recommended that you run your network through ALL the quality controls before attempting to use any of the RivEX processing tools. YOU HAVE BEEN WARNED! 1.If RivEX is open, close it by clicking on the close button in the bottom right of the dialog. 2.Now reopen RivEX again by clicking on the Yellow button in the tool bar. Complete the layer to process panel and shown below. If RivEX asks to build a spatial index then accept this. Make sure you set the workspace. 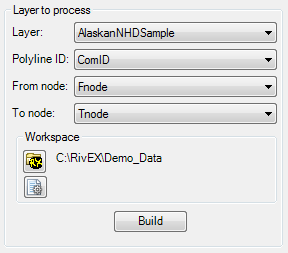 3.Pressing the Build button tells RivEX to compare the modification date of the dataset with what is stored in the settings file, if it is found to be different then it will rebuild the topology cache otherwise it accepts the dataset and enables the tools. 4.In the Tools panel, expand the Quality Control tool, tick on "Run quality control tools" and then press Run Tool to open the quality control dialog. 5.In this walk through you will run only 3 tools as shown below, tick these on and press OK to execute them. 6.RivEX will report its progress in the progress panel. RivEX will search the network for the various errors. If it finds any errors it will create an error log file and store it in the ErrorLog folder. 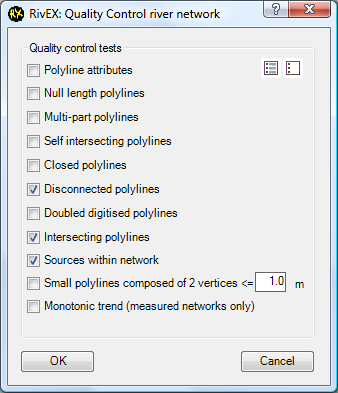 This lists which polylines have errors. If it finds none then you can be confident that the network is safe to continue with. Do not assume that the network you have is error free even if it was supplied by a national agency, always run it through the RivEX quality controls.